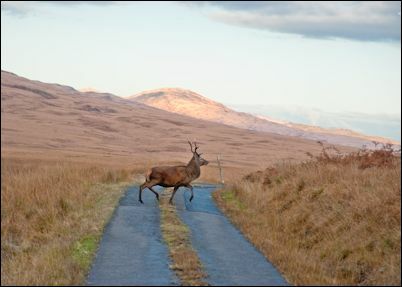 Jura comes from the Norse words meaning Deer Island. Today over 6500 deer live on six estates on the island. In contrast, the human population is less than 200. The island is 29 miles long and 7 miles wide in places. 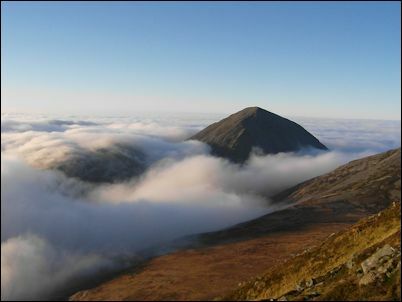 The west is wild and virtually uninhabited, occupied only by the three Paps of Jura which are known in Gaelic as The Mountain of the Sound, The Mountain of Gold and The Sacred Mountain. Many caves and raised beaches can be found on the west coast, but you'll have to be a good walker to reach them. If you want to get away from it all, this is the place to come. The novelist George Orwell who stayed on the island at Barnhill during the 1940s quite rightly described it as "an extremely un-getatable place". Wildlife lovers will be interested to know that there are over 100 species of birds (including golden eagles) on the island, together with wild goats, seals, rabbits, hares, stoats and otters. 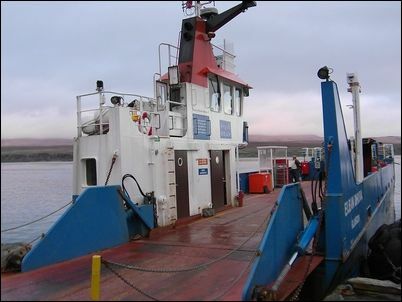 The main route on to Jura is via the small vehicle ferry from Port Askaig on the Isle of Islay. 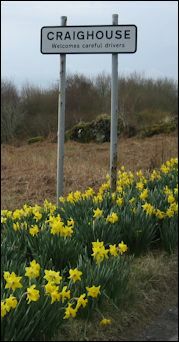 It takes just 5 minutes to cross to Feolin on the southern tip of Jura. Tel: 01496 840 681. Check the Council web site for prices and times. The Jura passenger ferry (12 seater RIB) will be running daily (except Tuesdays) from Easter to the end of September from Tayvallich (mainland Argyll) to Craighouse on Jura. Booking essential - phone 07768 450000. The Jura Bus is operated by Garelochhead Coaches (tel: 01436 810200) and travels between Feolin Ferry to Craighouse and north up the island to Inverlussa Click here for timetables. Jura Island Tours is run by Alex in his luxury Mercedes 16-seater mini coach. Short guided tours or full days from Craighouse or Feolin. He also operates a taxi service. Tel: 01496 820 314 or 07884 024 777. 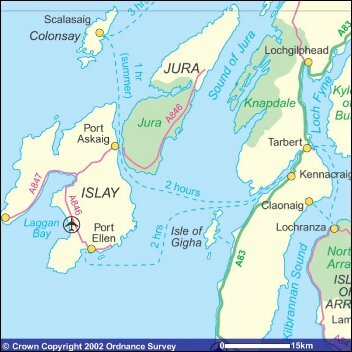 Jura Development web site has a detailed map of the island. If you are going over on the ferry from Kennacraig to Islay and need a place to stay, Springside B&B is a traditional cottage overlooking Tarbert harbour (just 5 miles from the ferry terminal at Kennacraig) between Loch Fyne and the Mull of Kintyre. 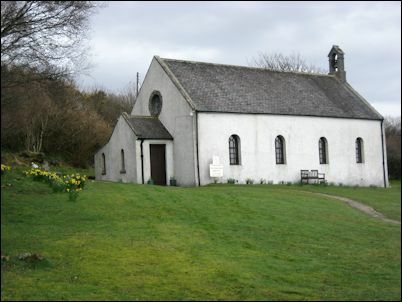 Next to the ferry terminal, Feolin Ferry House holds the largest database of information about the Isle of Jura in existence in the world. Located 5 miles from the ferry at a place called Ardfin or White Promontory. The house was built by the Campbells in the early 1800s. Previously available as self catering, it was bought by a new owner in 2010. The gardens are closed to the public and he has built an 18-hole golf course on the estate. You can see two little islands offshore. The one on the right is Am Fraoch Eilean or Heather Island which controlled the entrance to the Sound with the now ruined Claig Castle. The grey coloured beach is made from grains of the local quartzite. Further along, the path runs next to some of the famous Jura slate. A longer walk will take you to The Misty Pool, waterfall, Bronze Age burial cairn and also a Neolithic chambered burial cairn thought to be 2000 years old. The capital of Jura is 8 miles from the ferry. It is probably the only place on the island you will find anywhere to eat or drink. The village is home to petrol pumps, post office, gift shop, church and the Jura Hotel which has its own web site full of local information. Antlers Bistro and Restaurant has good food, crafts and local info. The Jura Community Shop is run by the community. If you are going to Jura and need groceries/supplies arranging in advance, just let them know. Internet access is available at the Jura Service Point is next to the school in Craighouse. Open 10am - 1pm Monday to Friday. 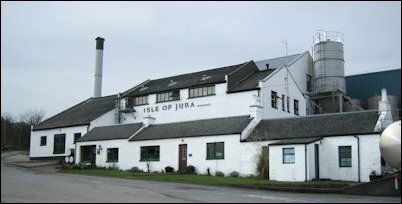 Isle of Jura Distillery produces a light malt whisky. The first official distillery on Jura was built in 1810 but there is evidence that illicit distilling took place as far back as 1502. It has been expanded over the years but still occupies the same site, draws its water from the same natural source and remains the only distillery on the island. Guided tours by appointment - telephone 01496 820601. Visit isleofjura.com for more details. Just north of Craighouse is the old crofters' settlement. Today most of the remaining thatched roofs on the cottages have fallen down, but you can still imagine how the people lived. Ardlussa and Inverlussa: cemetery and cottages overlooking the bay. Saint Earnan, the uncle of Saint Columba, is buried in Inverlussa graveyard, together with a lady called Mary MacCrain who apparently lived until she was 128. The road, such as it is, stops here, but if you continue along the track (unsuitable for motorised vehicles), eventually it reaches the northern tip of Jura, where George Orwell wrote 1984 and almost lost his life in the Corryvreckan whirlpool. These mountains are not that easy to get to or to climb when you reach them. The upper slopes are mainly made of scree and lumps of quartzite. You are recommended to wear strong boots. It can easily take you the best part of a day just to reach and walk up one of the 3 mountains, but on a clear day you will be able to see for miles from the summit. They rise to around 2400-2500 feet. Check if deer stalking is in progress (usually on days between 1 July and 20 October) by using the hillphone service, tel: 01496 820151. 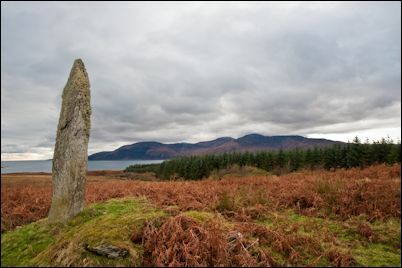 There are several standing stones scattered about the east coast of Jura. A Neolithic burial cairn can be found south of Strone farm. South-east of Ardmenish, on Lowlandman's Bay is the dun known as An Dunan. The ruins of Glengarrisdale Castle are in the north-west of the island. 17 - 19 May 2019: Scottish Island Peaks Race - starts in Oban, then Mull (Ben More), Jura (the Paps), Arran (Goat Fell), then Troon. This 589-page hardback is the definitive historic reference book about the island. It includes sections of old b/w photos, colour photos and portraits. Published in July 2001. The Isle of Jura Hotel is the island's only hotel. Located at Craighouse. 18 rooms. Open all year. Telephone: 01496 820243 / Fax: 01496 820249. Corran House B&B is 4 miles from Craighouse, and around 10 metres from the beach. Ensuite rooms. Steve and Fiona Walton. Tel: 01496 820 374. Ardlussa House offers dinner, B&B. Contact Andrew & Claire Fletcher - Tel: 01496 820 323. Ardlussa House offers slef catering for 10 people in 5 bedrooms in a self contained wing of the house. Stalking & fishing available on the Ardlussa Estate. Boiden Cottage is located at Ardfarnal, 5 miles from Craighouse. It sleeps 6 in 2 bedrooms (1 double bedroom and 1 bedroom with a double bed and two single beds). Scottish Tourist Board 3 Stars. Telephone Drew & Christine Fairman: 01496 820393. Burnbank is a 2-bedroom cottage situated above the village of Craighouse. Dubh Bheinn is a cottage with 2 bedrooms at Crackaig Bay (1.5 miles from Craighouse). Four Woodside is a 3-bedroom house with garden in Craighouse. Sleeps 6. 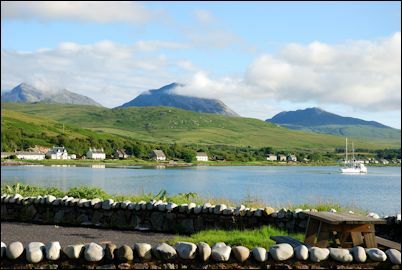 Gealach Lan Holiday Cottage at Craighouse has spectacular views over the Sound of Jura and is within walking distance to all the village amenities. Sleeps 6 in 3 bedrooms. Jura Holiday Let is a 3 bedroom house in Craighouse. 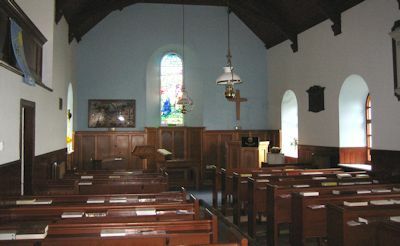 Leargy House is a former church restored to a high standard to self catering accommodation with 3 bedrooms. Located 2 miles north of Craighouse. Oran na Mara is a modern cottage with sea views. 3 bedrooms sleeping up to 5 people. 3 miles from Craighouse. Dogs welcome. Otter Cottage is one of just 4 cottages in the unspolit Lussagiven Bay, 16 miles north of Craighouse. This refurbished croft house, only 30 metres from the sea, has 2 bedrooms, bathroom, kitchen and sitting room. Small Isles House in Craighouse sleeps 6 in 3 bedrooms. Tigh-an-fhigheadair (House of the weaver) - a modernised croft house with 3 bedrooms. Located just outside Craighouse. JuraInfo.com includes blog, video, photos, etc.